(CNN) -- Here's yet another reason to stay in shape: Thinner people contribute less to global warming, according to a new study. More than 1 billion adults worldwide are overweight, and about 300 million are obese. Researchers at the London School of Hygiene and Tropical Medicine published a study showing that, because of food production and transportation factors, a population of heavier people contributes more harmful gases to the planet than a population of thin people. Given that it takes more energy to move heavier people, transportation of heavier people requires more fuel, which creates more greenhouse gas emissions, the authors write. "The main message is staying thin. It's good for you, and it's good for the planet," said Phil Edwards, senior lecturer at the London School of Hygiene and Tropical Medicine. The study offers this novel approach to the global warming problem as U.S. lawmakers discuss the future of climate change legislation. This week, the the House Energy and Commerce Committee is scheduled to begin on a comprehensive energy and climate bill. On Friday, the Environmental Protection Agency announced that six greenhouse gases pose potential health hazards, an announcement that could prompt the regulation of the gases. 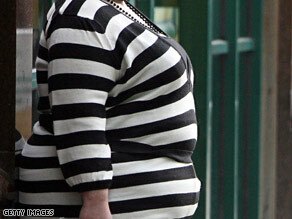 More than 1 billion adults worldwide are overweight, and about 300 million are obese, the study said. Generally, the body mass index, a measure of obesity, is increasing in most countries worldwide, from China to European countries to the United States. BMI is going up because of the availability of food and motorized transportation, Edwards said. People are less active now than they were 30 years ago, and the prevalence of fast food has given people less healthy, more energy-dense options. Using statistical models, the authors compared the distribution of BMI in the United Kingdom in the 1970s -- when 3.5 percent of the population was obese -- with a prediction for the country's BMI distribution in 2010, reflecting 40 percent obesity. "In terms of environmental impact, the lean population has a much smaller carbon footprint," Edwards said. The population with 40 percent obese people requires 19 percent more food energy for its total energy expenditure than the population with 3.5 percent obese people, the study showed. This 19 percent increase in food consumption translates into an increase of 270 million metric tons of greenhouse gas emissions, the study said. "The findings make sense and highlight an important global co-benefit of losing weight, along with the significant personal health benefits," said Patrick Kinney, associate professor at Columbia University's Mailman School of Public Health, who was not involved in the study. In terms of obesity rate, the U.S. population is not far off from the overweight population model in this study. The country has 33.3 percent obese people, according to the Mayo Clinic. The study suggests that governments have a responsibility to encourage people to be more physically active, Edwards said. Active transportation, such as cycling and walking, helps maintain a healthy weight but requires safe streets, he said. "If the government wants to promote active transport, which would be good for the environment and for individual health, it needs to make the environment safe to do that," he said. Although climate change has come into the forefront as a major world problem recently, this is not the first time scholars have thought about the connection between fossil fuel and body fat. In 1978, a year the United States experienced an oil shock, a study in the American Journal of Public Health showed that if all overweight people in the country aged 18 to 79 reached their optimal weight, the resulting energy savings would equal 1.3 billion gallons of gasoline. After the dieting period, about 750 million gallons of gasoline would be saved every year, said the authors, Bruce Hannon, professor at the University of Illinois, Urbana-Champaign, and Timothy Lohman, now professor emeritus at the University of Arizona. Today, research has shown that the obesity epidemic costs the United States about $100 billion a year, said Dr. Martin Donohoe of Portland State University, who runs the Web site Public Health and Social Justice. In terms of energy expenditure, the average food product travels 1,500 miles to get to your table, he said. Some measures to curb obesity include making healthier meals available in schools, putting nutritional information on food packages and menus, and banning trans fats, he said.